Airline passengers have been warned by US authorities not to switch on or charge their Samsung Galaxy Note 7 phones when on board the plane. The Federal Aviation Administration (FAA) also advised against packing the phones into any checked-in luggage. 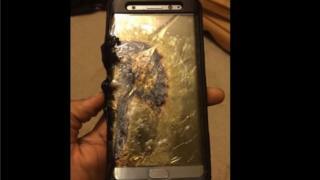 Samsung recalled the phone last week after reports emerged of the device exploding during or after charging. Qantas and Virgin Australia have also told customers not to charge or use the phone during flights. Samsung said it would speed up shipments of replacement Galaxy Note 7 phones to ease safety concerns. Earlier this week, US TV channel Fox 10 reported claims that a faulty Galaxy Note 7 had set fire to a family's Jeep. Samsung has said that battery problems were behind the phones catching fire, but that it was difficult to work out which phones were affected among those sold. "In light of recent incidents and concerns raised by Samsung about its Galaxy Note 7 devices, the Federal Aviation Administration strongly advises passengers not to turn on or charge these devices on board aircraft and not to stow them in any checked baggage," the FAA said. Following Samsung's recall of its Galaxy Note 7, Qantas said on Thursday it was "requesting that passengers who own [the devices] do not switch on or charge them in-flight." The phone was launched last month and has been otherwise generally well-received by consumers and critics. Some 2.5 million Note 7s have been shipped globally. Samsung has said customers who have already bought the phone will be able to swap it for a new one and that it would take about two weeks to prepare replacement devices. This is precautionary advice and not understood to be in reaction to any incident on a plane. But it does continue the headache for Samsung - even once the company goes through the motions of getting the device recalled, the Note 7 will forever be the exploding smartphone. This is not the first time the FAA has warned about the dangers of lithium batteries on flights. Earlier this year, it urged airlines to assess the risk of transporting lithium batteries as cargo. And the administration also insists that any spare lithium battery be kept with the passenger rather than kept with luggage in the hold - though as a person who regularly travels with big lithium batteries for camera equipment, I can tell you this is inconsistently enforced. The US trade group Airlines for America said it was "closely monitoring" the Note 7 issue and that carriers in the US would make their own ruling over the use of the phone on board. "Each individual carrier makes determinations, in compliance with FAA safety rules and regulations, as to what is permitted to be carried on board and in the cargo hold," an Airlines for America spokesperson said in a statement. South Korea-listed shares of Samsung Electronics were down close to 3% in early Friday trade. Video Will the Samsung Galaxy Note 7 take off?